I recently bought some CYMA MID cap mags for my G36 but hadn't had a chance to try them until the weekend. The BB's are now stuck inside and there is no compression in the spring. I've emailed Patrolbase and I'm waiting for a reply. Looks like the bit o plastic that should be attached to the end of the spring has come off and now you just got a bunch o bb's stuck inside a spring. Monty's guide should help you repair it, hopefully the plastic spring end bit is stuck in there somewhere and not fallen out and lost. Brilliant, thanks guys, I'll give it a go. Worse case it's knackered and I get a replacement from Patrolbase. Will try it and let you know. I thought it was the spring. Well I got it apart, unfortunately it was nothing like the one in the video and no 'single screw' to release the internals. I did discover that the little rubber 'ring' should have fitted around the 'feeder top' that pushes the BB's up. 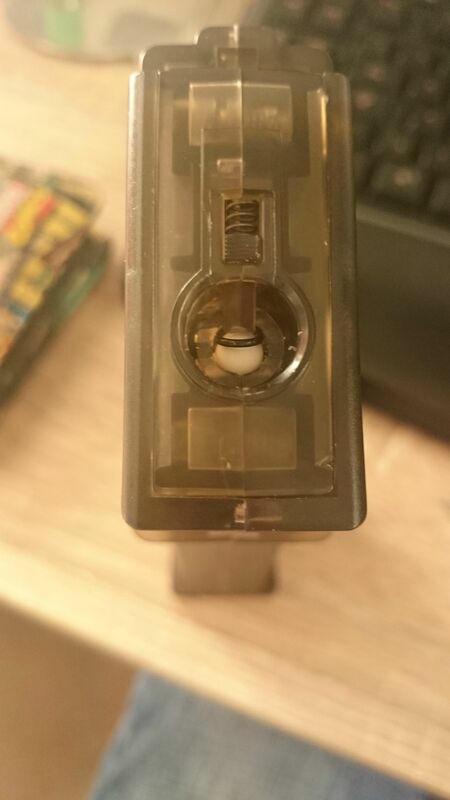 It may have been from the speedloader but it appears to fit in a little 'groove' on below the feeder top. However lots of bits of broken plastic also came out along with a metal 'square nut'. Basically it's fudged I've put it back together as best I can but will have to send it back. Looks like an O ring. Pull it out. Edit: broken plastic is baaaad.